Here is a treasure of my childhood! He has a place of honor in my jewelry display (which involves monkeys!). My jewelry is much more displayed than ever worn, I regret, I'm not that kind of girl! I'll admit, like many girls of my time, in our early teens in the early 90s, that I had a thing for Phantom of the Opera. That was back, long ago, before we had the Internet (I guess, it was around, but WE didn't have it) and before werewolves and vampires started appearing together in books and/or movies. Also, before wizards were being educated at boarding schools. So, what choice did we have but Phantom? I've even seen the show! I suppose that helps. There was a timely marching band show rendition of the musical, not our school but a rival, and dude.... I listened to the soundtrack constantly (even branched out to Cats, I shudder to remember), had a book with pictures and the score, even made a Phantom themed cross-stitch sampler that I was horribly embarrassed by months after finishing, but now I sort of wish I still had. 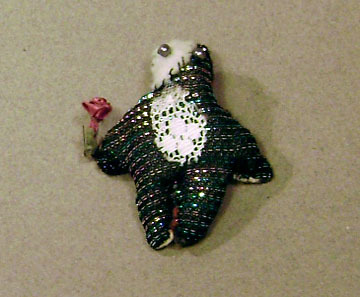 It is, however, likely that my sister made this particular guy, he's a pin, made from sparkly scrap fabric left over from a witch's cloak from a Halloween costume. The rose came from the little independent craft store, one of the few shops in town we could walk to, apart from the gas station. They seemed to specialize in plastic doll parts, from what I can recall. Plastic doll parts and wooden things you can paint!